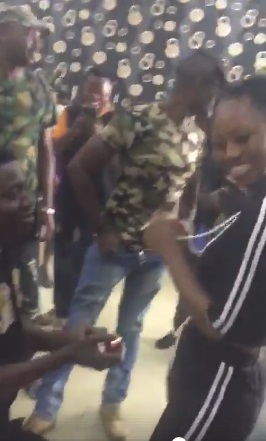 A Nigerian man teamed up with a set of soldiers just to propose to his girlfriend. The man was seen in the video pretending to be molested by soldiers (but it was all planned) just to propose to his girlfriend. As the girl arrived the scene, she asked what her boyfriend has done, and was seen putting her hands together appealing to them. 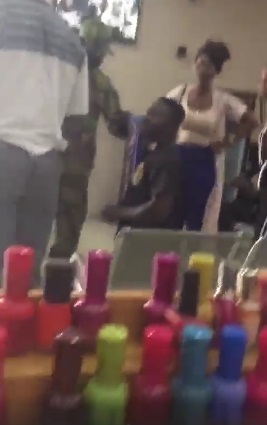 Just as she was appealing, the man turned around and proposed. People at the scene screamed.... Towards the end of the video, he hugged her after saying yes, and went to shake hands with the soldiers thanking him them for making his dream come true, LOL. It's a Facebook video, so you have to watch it here.